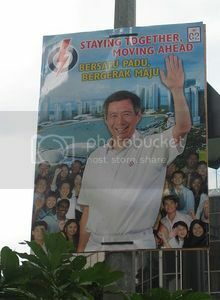 Blogger questions way PAP has run S'pore. yaevlejunce. Now that I am of age to vote, I am unable to vote for the PAP in the coming election because there is such an urgent need to send across a strong signal through their very thick skulls that there is a problem in the way it’s running this country. I am not a member of the Opposition, and I do not want the Opposition to take over this country, but because there will always be too many sheep in Singapore anyway, we need every vote FOR the Opposition just to manage to produce a dent in the PAP’s smugly expected results. There will always be the apathetic, the boot-lickers, the cowardly, and the ignorant to ensure they win eventually anyway. The difference we can make, however, is how much it wins by. Perhaps if it loses a GRC or two (and the GRC is a PAP invention), they will shake off their slumber and start ruling Singapore as a Republic, that is, for the public, for the People (rather than for personal interests). Remember how LKY said he will send in the army if there ever is a “freak election” and the PAP is voted out of Parliament? In every other country, when the people vote out the ruling party, it is called a mandate. It is only in Singapore that such a vote is called a “freak election”. Also, whose Army is it anyway? Is it the Army of the people of Singapore – who have just voted out the PAP? Or is it the Army of the PAP?